It’s March, which means it is officially National Cerebral Palsy Awareness Month! In honor of Cerebral Palsy Awareness Month, here are my top 15 things to know about cerebral palsy. 1. Cerebral palsy is a neurological disorder. Cerebral palsy refers to a group of non-progressive disorders affecting movement, balance and posture. The condition stems from deformities in the developing brain or from brain damage sustained before birth, during birth, or within the first three years of life. In cerebral palsy, the signals from the brain to the body are lost or redirected, resulting in the difficulties with movement people with cerebral palsy face. 2. There are a variety of types of cerebral palsy. Cerebral palsy manifests itself in a variety of ways. The three primary types of cerebral palsy are spastic cerebral palsy (characterized by muscle stiffness in at least one limb), athetoid cerebral palsy (characterized by involuntary movement) and ataxic cerebral palsy (characterized by difficulty with coordinated movement). However, cerebral palsy can also present itself as a mixture of these types. Spastic cerebral palsy is further categorized by the limbs affected by cerebral palsy. Spastic cerebral palsy can primarily or exclusively affect the legs (spastic diplegia), one side of the body (spastic hemiplegia) or can affect all four limbs (spastic quadriplegia). In rare cases, spastic cerebral palsy can affect one limb (spastic monoplegia) or three limbs (spastic triplegia). 3. Cerebral palsy can be mild, moderate or severe. Cerebral palsy has a wide range of severities. Some people with cerebral palsy may not be visibly disabled or may appear to be mildly uncoordinated, while others have very little control of their bodily movements and may have other neurological symptoms, such as vision or hearing impairments, seizures, intellectual disability or difficulties with speech. Many people with cerebral palsy lie between these extremes. Depending on the severity of their condition and their needs, people with cerebral palsy may use leg braces, canes, crutches, walkers or wheelchairs — but not all need assistive mobility devices. 4. Treatment for cerebral palsy includes Botox injections, orthopedic procedures and therapies. Botox is no longer just for Hollywood’s top celebrities; it is currently used as a injection to relieve muscle stiffness in people with cerebral palsy. 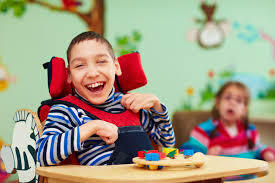 In addition, many people with cerebral palsy undergo tendon lengthenings and other orthopedic procedures, such as serial casting, in order to maintain movement.To increase functioning on a day-to-day basis, those living with cerebral palsy may attend physical therapy and occupational therapy to develop motor skills and increase independence, as well as speech therapy to improve speech and communication skills. 5. Cerebral palsy is not an intellectual disability. Although it originates neurologically, cerebral palsy itself is not an intellectual disability — though it can be present alongside intellectual disability. Many people living with cerebral palsy have average or above-average intelligence — just as in those without cerebral palsy. Therefore, it is of the utmost importance to presume competence when interacting with people affected by cerebral palsy. 6. Many people with cerebral palsy experience physical pain. Cerebral palsy can cause a significant amount of wear and tear on the muscles, particularly over time. Pain may arise out of the abnormal muscle movements present in cerebral palsy. 25 percent of children and teenagers with cerebral palsyexperience pain, while up to 84 percent of adults with cerebral palsy experience physical pain. 7. People with cerebral palsy have a variety of identity preferences — and these should be respected. People with cerebral palsy generally refer to their disability identity using either person-first or identity-first language. Person-first language places the focus on the person, rather than on the disability (“I have cerebral palsy” or “I have a disability.”) Identity-first language places the focus on the disability as an integral part of identity (“I am disabled.”) It is important for the able-bodied population to respect these identity preferences and not change or “correct” self-identifying language. 8. Cerebral palsy is often misrepresented by the media. Cerebral palsy is a highly misunderstood medical condition, largely due to the media’s descriptions of the condition. It is often incorrectly characterized as a “disease,” presumed to be genetic, or reported as a progressive condition. In addition, those with cerebral palsy are frequently described as “victims” or “sufferers,” though the vast majority of people with cerebral palsy live fulfilling, happy lives. 9. There is still a heavy social stigma surrounding cerebral palsy. Due to the pervasive misconceptions surrounding cerebral palsy, some people with the condition may be reluctant to disclose their disability or share their experiences with others out of fear of being misunderstood or stereotyped. They may also attempt to conceal certain symptoms. Some people with less visible cerebral palsy go to great lengths to hide the condition. Understanding cerebral palsy can reduce the stigma and stereotypes surrounding the condition. 10. People with cerebral palsy are not required to educate the able-bodied population. Oftentimes, those living with visible cerebral palsy receive personal questions in public regarding “what happened” to them, why they use particular assistive devices or how they accomplish certain tasks. Although some people with cerebral palsy are willing to answer politely-worded questions, it is not their responsibility to educate others about the condition, and they have the right to decline to answer intrusive questions. It is crucial to understand that no one is entitled to be educated in a public setting or to receive a stranger’s medical history. 11. People with cerebral palsy can be independent. From a young age, many people with cerebral palsy learn adaptive skills to maximize their independence later in life. Although some people with cerebral require high levels of assistance, many people with cerebral palsy can drive or transport themselves independently, live independently, and support themselves financially. 12. Those living with cerebral palsy can experience the same life milestones as the able-bodied population. People with cerebral palsy attend and graduate from college and graduate school, establish fulfilling careers in a wide variety of fields, date, marry, own homes, start families and care for their children — just like the able-bodied population. 13. People with cerebral palsy enjoy a wide variety of activities. Cerebral palsy does not prevent those who have it from enjoying a variety of activities. People with cerebral palsy are writers, performers, hikers, techies, crafters and collectors. They play sports, compete on debate teams, volunteer their time and hold leadership positions in their schools and communities. 14. People living with cerebral palsy are not “heroic” or “inspirational” for living their lives. People with cerebral palsy are frequently deemed “heroic” or “inspirational” for engaging in everyday tasks or for simply existing. Although those who use such terms are generally well-meaning, their words evoke pity, as they are based on the misguided assumption that living with cerebral palsy is unfortunate and tragic. On the contrary, people with cerebral palsy live full lives, and many take pride in their cerebral palsy and the unique perspective it provides. Those with cerebral palsy, therefore, are neither heroic nor inspirational — unless they do something that truly merits being placed on a pedestal. 15. People with cerebral palsy are capable. Each person with cerebral palsy has a variety of skills and talents. Some are athletic, musical or creative. Others are scientifically-minded, entrepreneurial, linguistically talented, or emotionally intelligent. No matter what skills or talents they may possess, all people with cerebral palsy are capable and have immense potential to succeed in life.